The Atlas Orthogonal Technique and treatment is an upper cervical chiropractic treatment technique created by Roy Sweat, DC. AO is a low force instrument adjustment to the Atlas bone. The Atlas bone is the first vertebra in the neck; it is responsible for supporting the head that houses the brain and brain stem. An Atlas Orthogonal adjustment puts your head and neck in proper balance, restoring your body’s natural healing abilities. "Atlas Orthogonality is an upper cervical spinal program to find subluxations throughout the spine. Based on scientific and Biomechanical procedures using physics and mathematics for vectored solutions. The better the subluxations are corrected, the better the physiological and pathological results, which have been researched, determined and documented. Chiropractic will live or die on it's achievements and performances to find and correct spinal subluxations. This is ONE service our Chiropractic profession has to offer that NO other profession has." Read what patients have to say about their AO experience. or, View a video about AO. 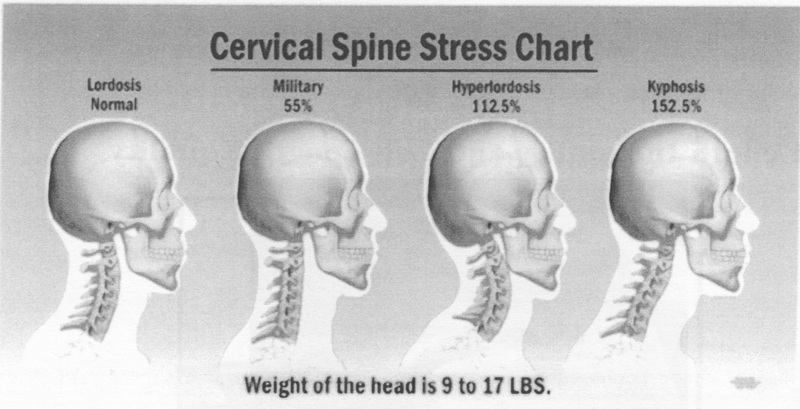 The following diagrams illustrate Stress on the Cervical Spine, and the Effects of Spinal Misalignment.